I wonder how you ended up here. Did you use SAP search or a kind soul tweeted this? Or is it 2047 already, the problems I wrote about have been fixed (or our site has disappeared) and you are conducting a small research how one can wreck user experience with the best intentions in mind? This blog is not going to be a rant, I promise – complaining does not help and I am tired of waiting for solutions to seemingly basic problems. My aim is to share yet another set of workarounds to handling multiple identities in the SAP ecosystem. The problem is the following – when you switch jobs, or get assigned to managing customer’s systems, or your company is acquired by another SAP customer, you end up with a bunch of S-users. It is also possible, that you have created a personal (P-user), which you use to post content in SAP community, like many others. Unfortunately, after introducing the new profile concept (and SSO), accessing various sap.com sites has become a challenge. Use private browsing mode in a single browser – type user/password, access the site, log out, perform a few rituals, then log in with a different user. Option 1 is almost OK if you have just a few user IDs and if you don’t consider using IE as an unusually cruel punishment. Option 2 is not bad, except that you are probably breaking a few rules, if you do that on a corporate laptop and that you need to update each browser separately, which is cumbersome with 10+ identities. Option 3 is acceptable if you use nearly all the time one of your user IDs or if handling multiple user IDs simultaneously is not a necessity (of course, there is the possibility, that you are just used to KeePass, which is absolutely fine). What I am going to share is yet another workaround to handle multiple identities in a single browser installation, simultaneously. 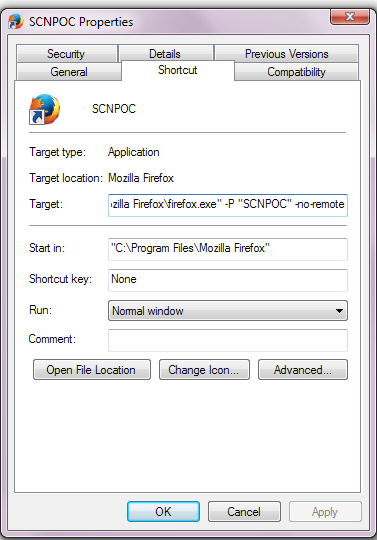 It works in Google Chrome and Firefox (potentially also in all Firefox clones). 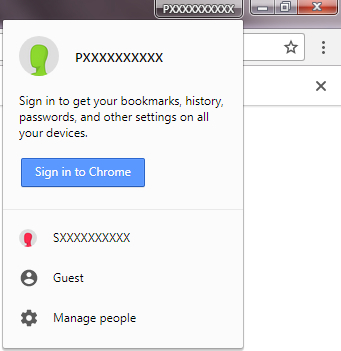 The idea is that these browsers support multiple profiles and since certificates, add-ons, security settings and user/password combinations are profile-dependent, you can easily separate the settings and run multiple instances of the browser at the same time, but with a different profile. The shortcoming (or the advantage – depends on how you see it) is having more than one browser window open – for each identity that you need at the time. This one seems to be the most common browser choice and luckily, the easiest to set up for our scenario. Click on the small icon (1) and from the menu select (2) – manage people. 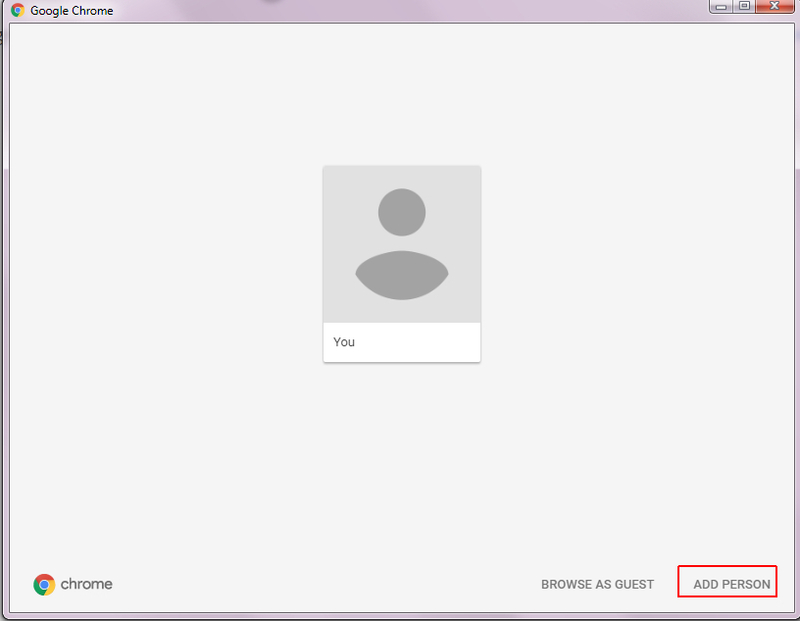 A new popup will be displayed – select Add Person. You will have an option to set names and avatars for your different identities before saving. Here is how my test profiles look like – of course, you could come up with better names and you can have a lot more identities, but the approach is the same. 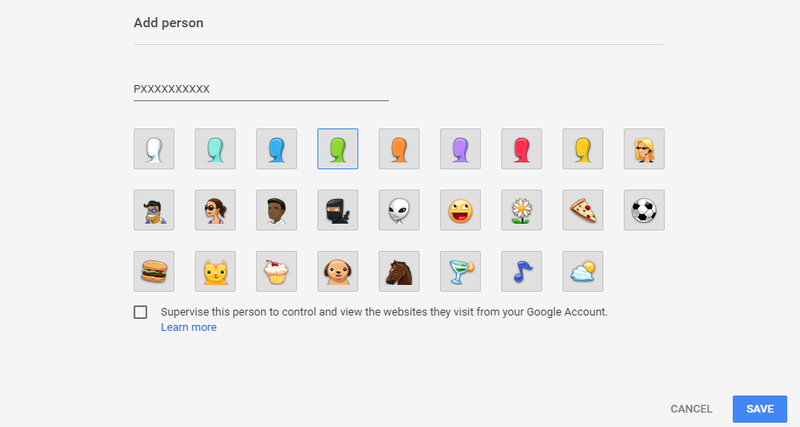 After you create the profiles, you can set them up exactly as you normally do after browser installation – set up to remember passwords, import bookmarks, possibly import certificates. 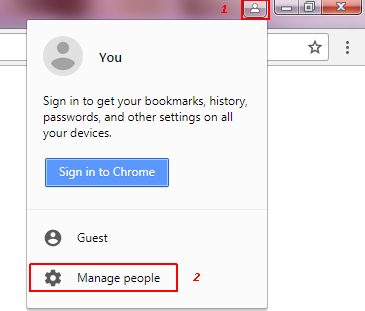 By default, when you start Google Chrome, it will use the last accessed profile, but you can always select a different one from here and it will open a new browser window (this time with the profile that you need). As you can see, I am logged on to SAP Community with my P-user (main answers page). 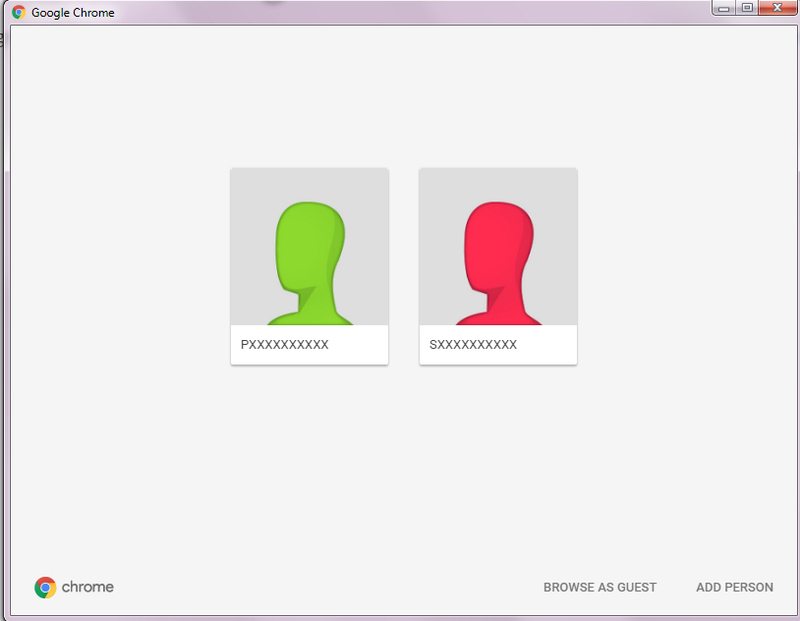 Now if I select the profile for my S-user and navigate to the same page, I would not be logged in as a P-user. What is more important, I can access SAP notes from the S-user profile without affecting the P-user browsing. Distinguishing which browser window to use in a specific case will be easy if you choose good profile names. Firefox used to be the go-to browser for people, who wish to have access to lots of fine-tuning and customization, it is also older than Chrome, which is probably the reason why this setup is not as easy and straight-forward. This will start the Profile Manager, from where you can create the profiles, which you need. 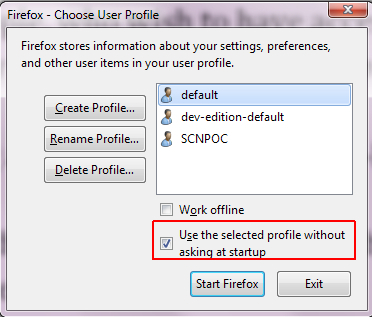 You can decide to show the Profile Manager every time you start Firefox and choose a profile each time, or you can create shortcuts to profiles and run the browser from the shortcut. 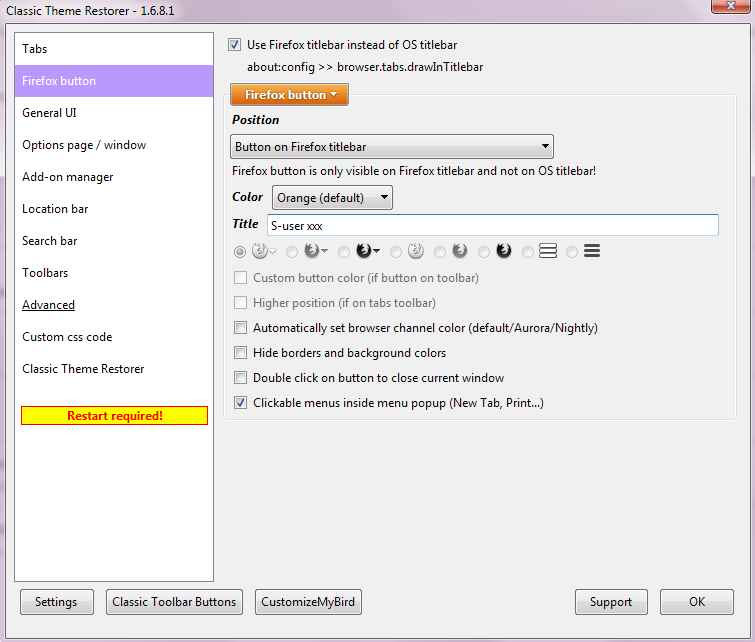 In the first case – the checkbox from the previous screenshot should not be selected. You can store the shortcuts on your desktop, or if you prefer to keep it cleaner – add the folder, where you stored the shortcuts, as a toolbar. Which profile am I using? Now, this is a tricky question – unlike in Chrome, it is not immediately obvious which profile was selected for a certain window. Unfortunately, installing add-ons is a luxury, which you rarely get on corporate laptops and, which is even more disappointing, this add-on will cease working in Firefox 57 (this November) and in Firefox ESR 59 (next year). UserContent.css is also profile-dependent, which means that you could change the appearance of other web pages if you wish to have the same URL as a home page in all profiles. There is also a tiny workaround for IE11, but it is far from a profile switcher/manager – just a trick to separate cookies aimed at the unlucky ones, whose administrators have handicapped them to the single browser-like software, named Internet Explorer. Normally, one is used to opening a new tab and typing a url or accessing Favorites to navigate to SAP Community pages. This will result in you being logged in as the current S-user, which you are trying to avoid. Instead of CTRL+T you can choose File->New Session – this will take care of the cookies. I tested with three separate profiles – this is the least convenient way to use sap.com from all alternatives, but if you combine it with KeePass (or similar) to avoid typing, it is somewhat manageable. All of this is common knowledge and the information is easily found in the web, the setup is really simple – even for less tech-savvy people, which is why I cannot understand the need to use separate browsers to access the site with different logins. The workaround is not perfect; it is a rather ugly way to handle poor UX and cannot be considered as a fair replacement to a real solution or any official workaround, which a member of the project team could potentially suggest. If you believe that Idea Place is not dead yet and that voting on ideas could help allocating more resources to redesign the current profile concept, you could up-vote https://ideas.sap.com/D37848 or any other, which you would like to see implemented. There is an interesting option, available in the current Nightly release 57.0a1 (2017-08-07) – Container Tabs. It is enabled by default, but make sure that you are not using private browsing mode – otherwise you will not be able to use it. You can also set accept cookies from visited and remember search and form history in about:preferences#privacy, if this is how you wish to access the site. I clear cookies on browser exit, which is a wise thing to do when accessing sap.com pages. The purpose of Container Tabs is to separate website content, including cookies, which means, that it can be used to log on to the sap.com sites with multiple identities. I have set up two new identities from about:preferences#general and added the button for container tabs via the Customize menu, but if you don’t like seeing too many buttons, you could use File→New Container tab from the Menu bar. Starting from my S-user (I have already saved user/password as I do not use certificates). I usually access sap.com pages via a direct expert search link with this user. As you can see, it is easy to figure out which identity you are using in a specific tab – the name is displayed in the URL bar and the tabs with the same identity have different line colors (I chose red and green when creating container tabs on purpose). If I wish to use the same identity in a separate tab, I need to open a new tab of with the same container. 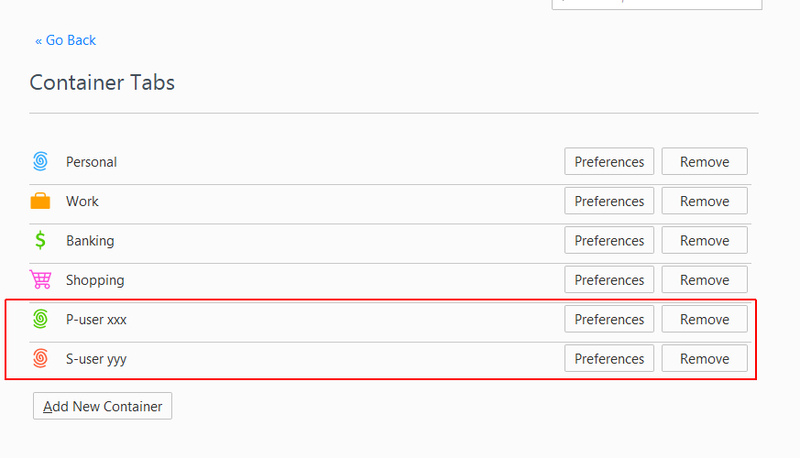 If I select a different container – P-user yyy and try logging on from https://answers.sap.com/index.html, I will be logged on with my P-user, because I saved my login data for it in container P-user yyy. Open in new tab, when you use containers results in opening the link in the same container, which is a nice feature saving you clicks and copy/pasting. The results of testing the feature look quite promising, considering that this is a Nightly. Still, a fair warning: I use Nightly only for testing purposes and to get an early preview of what is coming up in future stable releases. I cannot and do not recommend installing it for productive use and storing sensitive data in any alfa or beta releases. There is a good reason why ESR exists and you are less likely to experience crashes or be exposed to new vulnerabilities with ESR (if you don’t get wild with installing add-ons). The reason why I included Content Tabs as a potential workaround is that this one is more likely to be implemented in the foreseeable future than the anticipated redesign of the profile concept in sap.com. Since i got just 1 P and 1 S user, working with Chrome / FF is enough for me, but your blog is really wonderful and offers a nice workaround. i shared it on Twitter and Linkedin too, hope you do not mind! I don’t use the workaround either, because my primary browser is not officially supported, but in a few months I will probably end up with something similar to one of these options. Great work Veselina. Yes I did come to your blog via twitter and i’m glad i did! Using SCP every day has made this a pressing issue but I get by with the multi browser approach. I will give your technique a try. Thanks! Same sentiments as Mike – thanks for providing a possible robust solution to the Log in, Log Out, Log In problem. I came here from Coffee Corner (aka the SCN Twitter 🙂 ). Thank you for a helpful workaround! Thanks for taking the time to put this together. Excellent information. Great blog, Vesi. You don’t blog often (although a lot of your comments/responses could be blog worthy), but when you do, they are A-star! Most days I just use one S-user on IE for the Support Portal, and one P-user for SC/SCN/Jam. But once in a blue moon, I might need to use an odd user (that goes through SAP ID authentication), so your workaround is definitely handy for those cases. Thanks again! Thank you for describing this magic sequence of steps. I was using the Chrom / IE combination but that’s really annoying.